Yes, this post has a good Halloween feel. Not very little girl party feel. Still-love the dress! I like the dark twist on a princess. Princesses are usually depicted as lame and frilly, but your assassin princess is cool and bad. Love it! So happy to see dresses back. I would check in every so often to see if you were back. You are my fav paper doll artist. You know, I think Assassin Princess would be a great name for an all girl punk rock band… possibly in poofy skirts. A) Congratulations on your adorable little boy! So cute, so much personality, and an adorable hat! Woo-hoo! You’re back! XD Lovely dress–will you be doing more masquerade gowns this Halloween? Those are my favorites! So glad to see you back and that Milo is doing so well! Hope to see a few costumes before the month is out! Thank you so much for all your dolls and dresses! I love your colored pencil work. It’s so clean and beautifully done! I love both the dress and the idea. I find the idea of a princess assassin and the way you present it so intriguing.As for the dress, well it is truly magnificent. Oh, what a great surprise to find you back. I had been checking periodically but missed you until now! This is a beautiful dress, and the idea of an assassin princess is a fascinating one. What a handsome, bright little boy you have. I absolutely LOVE the dresses that you put on here! I am a T.J.Ed youth, and a friend of mine and I are putting together a production of the Scarlet Pimpernel in NSL Utah and we’re having brain freezes on ideas for the costumes, and you always have the coolest designs, do you have any ideas? 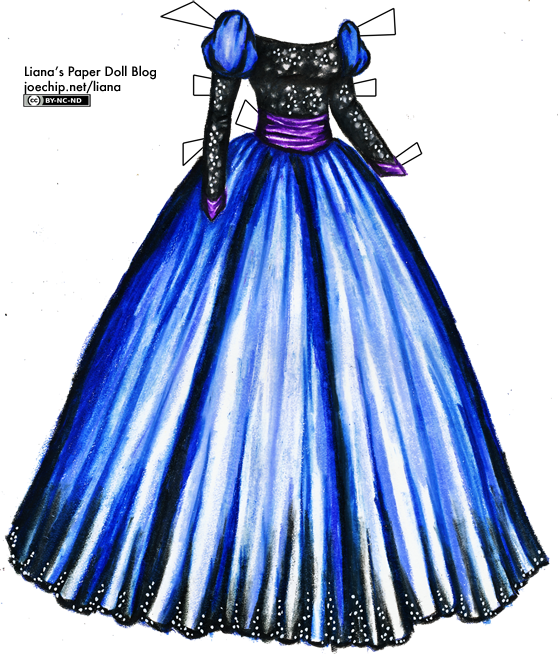 I am dying for anoter dress i love all of your dresses and ppare dolls are you planning on doing anohter one anytime soon? Are you planning to do another dress soon? The last one you did was in september. I LOVE your dresses! It’s so funny that we have the same birthdays!!!!! (December 3rd) I was wondering if you could draw a dress made out of rose petels? Will you ever be coming back?????? Ive been waiting. Good question, Liana. When are you coming back??? You’re not here, and without you, this site has no life :( Please come back!!!! Hello, I just happen to find this blog and I’m now in love with these bunch of adorable dresses. Thank you from Japan. I love your paper doll dresses and paper dolls they are simply beautyful. while you have been awys i have had a chance to look at some of your old work and it is so beautiful i keep cheaking back at the sight becasue i love your dresses i hope you will feel up to drawing another dress soon! and your little boy is so cute.. any ways i just wanted to say how much i love and apreciate you paperdolls your very talented i cant wait to see what you come up with when you come back to drawing paper dolls. The great paper doll master has disappeared!!!!!!!!!!!!!!!!! Could you do an outfit from inuyasha? If it’s not too much trouble? Please? The dress is beautiful, why can’t they make dresses like this? Dresses today only have slit skirts, low backs, short skirts, and plunging necklines.